"The world is flat" (Friedman). Never before globalization has not had such a large impact on the economy and human rights. We respect human rights as described in the Universal Declaration of Human Rights of the UN. Together with our suppliers we act according to the spirit of this declaration. In January, 2011. Addit became a member of the Global Compact of the United Nations. The Global Compact is the world's largest initiative for corporate responsibility and sustainable development. 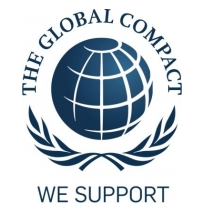 The Global Compact is a call directed to the business to business in its 10 basic principles of human rights, labor rights, environment and anti-corruption and promote social responsibility (CSR). More than 10 000 members from 135 countries have joined the Global Compact initiative. Principle 2. The elimination of all violations of human rights by the company. Principle 3. Respect for freedom of association. Principle 4: the elimination of all forms of forced labor. Principle 5: The abolition of child labor. Principle 6: the elimination of discrimination in respect of employment. Rule 9. The application and diffusion of environmentally friendly technologies. The principle of 10.Przeciwdziałanie corruption in all its forms, including extortion and bribery.